I've written before about the eternal struggle of getting ready in the morning. When I worked in advertising, I felt the need to put a little effort into my look since I was occasionally client-facing. Now that I'm tucked away in a cubicle in startup world, my look has further evolved into more of what I like to think of as "effortless." Effortless in the sense that, I put on jeans and a tee and that's as much effort as you're going to get. Enter: Cladwell. I got an email from their founder announcing their new "outfits" app and loved the concept - each day, the app serves up three outfit combinations based on the weather and what you've tagged as part of your closet. Unlike other closet curation apps like StyleBook (which I have used for years and also not used for years), you don't have to take pictures of your clothing to add it to your closet, Instead, Cladwell has curated 100s of articles of clothing and shoes to represent what's in your closet. They're not all going to be an exact match, but when "patterned blouse" pops up in my suggestions, I just choose from the 3 blouses I have that match that description. My "tie front blouse" is actually short sleeved. I know what it means. I use each piece as a suggestion, not a bible. Today's outfit just took note of the high, which was looking to be a rather warm afternoon. However, my office tends to be pretty cold and it was breezy this morning, so I threw on a jacket over the suggested outfit of the day. See? I'm already improvising. I didn't really need a jacket today, but I liked the idea of this outfit and thought it looked cute. The bomber was actually useful during office hours, but I shed it for the evening when we went to a baseball game. Maybe the forecast said rain and I wasn't listening while getting ready, but today's shoes were not prepared for torrential downpour! I was fine most of the day (which I'm guessing the app was betting on), but the rain rolled in at 5 pm just in time for me to take off my taupe suede and walk barefoot to the car. No cute photos today, but the shoes were saved. More pigtails for a cloudy, rainy, gross day. I actually worked from home this day, so I just snapped a quick pic before heading to the radio station to record. Thanks to the humidity to the days before, Friday was steeeeamy. I stepped it up when deciding between my three outfits and went with a skirt. I had an event later that evening I changed into a dress for, so these shoes were able to do double duty. Another gorgeous weekend in the books. This is one of my favorite dresses to just throw on and go, so I almost ALWAYS wear it when the app suggests. Didn't really need the jacket during the day, but it got cooler and windy when we were patio'ing and it turned out to be a great thing to have. Definitely starting to feel more summery in the Natural State now that June is almost here, so I let it flow a bit for the weekend in a camisole, ripped jeans and wedges while we ran our typical downtown errands. This was both a fun and interesting challenge. Since Cladwell is new, they definitely have a few things to work on - some of which they've already made changes to since I started working on this post. One of the main requests on their iOS App reviews is definitely more items - they've already added at least 100 more since releasing, and have a special form you can fill out to ask for specific items. I've got a request in for overalls. They've also added the option to "refresh" an outfit directly from the suggestion each day, so if you like the general idea of an outfit but not a particular piece, you'll get new suggestions. You can also reset your three options for the day completely, or choose a particular item from your closet and see outfits with just that piece. Another pro I forgot to mention in the list? You can log these outfits and see stats on how often you wear what's in your closet. Of course, this doesn't really help if you're not wearing that exact combination for the day. One big con for me is that their algorithm is still learning, so sometimes it'll suggest shorts mid-week when I'm supposed to be at the office, or a shift dress and heels on a Saturday. I hope to see them continue to tweak, and then offer further specialization to outfits as well. I think it would be a SUPER powerful app if you could customize it to your own needs - say, business casual outfits only for M-Th or only showing outfits with flats. If they develop a honed filtering system that helps you get the most out of your closet, and not just the outfit suggestions, this will be a home run. The app is $4.99 / month currently, with a three day trial so you can give it a shot. It's definitely aimed at those who want to do the whole "capsule wardrobe made easy" thing, but taking the thinking part out of getting ready in the morning may be worth it in the long run! Let me know what you think if you try the app - this is a non-sponsored post, so I'd love to hear honest reviews from those of you who have tried and how you're making it work (or not) with your lifestyle. UPDATE: I got this comment from Cladwell on some upcoming features and the exact item thing and thought I would share: Just so you know, now you CAN choose a specific item that you want to wear. Click that item in your closet, hit "show outfits" and then on each outfit it curates, there are three dots in the bottom right corner of each outfit. Click that, and hit "log this outfit" (So, more control that way). Yay! Also, we here you on some of your other cons! We are creating a new update where you can "categorize" your closet so that you can have different wardrobes for work vs. weekend. You'll also be able to edit outfits in the new update, so stay tuned!! That way, if you don't like the outfits you get or maybe want to swap out different shoes, you have more control. Thanks to a summer of funemployment, I inadvertently had a capsule wardrobe the past few months. I should've planned better and written dozens of posts (gotta get those CLICKS GUYS), but I didn't realize it was happening until I started seeing the same people while wearing the same clothes. Chances are, if you saw me this summer, I was wearing some variation of an outfit below. Casual, uninspired outfits don't make for great blog fodder, which is why it's been pretty slow on the blog this summer. 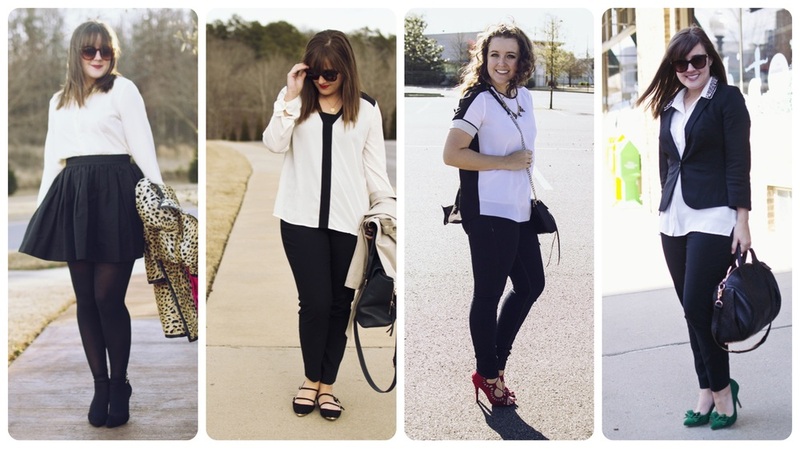 So I'm going to show you what I wore all summer long in one post! Outfit 1: Shorts, J.Crew Factory. Tank, Everlane. Sandals, XXI. Outfit 2: Shorts, Factory. Top, Banana Republic. Wedges, Vince Camuto. Necklace, BaubleBar. I bought them in white too. Outfit 1: Shorts, J.Crew Factory. Tank, Everlane. Shoes, Soludos. Bag, Alexander Wang. Outfit 2: Shorts, Factory. Top, Express. Bag, Gucci. Heels, Zara. What's that? The same shorts in white with a BLACK Everlane tank? Yeah. You're seeing it. It's happening. In fact, J.Crew has a bunch of different colors and patterns on sale right now, so I might be picking up a few more pairs (they're TTS). I also lived in these espadrilles from Soludos - super comfy, super cute. Outfit 1: Dress, Asos. Shoes, XXI. Bag, Clare V. Hat, Goorin Brothers. Outfit 2: Dress, Asos. Shoes, Zara. Bag, Vintage Chanel. When I wasn't in those magic shorts, I was probably in a dress. This particular black maxi is super soft (and kind of see-thru, whoops) and inspired by the one I loved from Theory. Grab a cute clutch like the leopard one here from Clare V. and you're good for day or night. Outfit 1: Dress, Old Navy. Shoes, XXI. Bag, JustFab. Outfit 2: Dress, Old Navy. Shoes, Zara. Vest, XXI. This dress cost like $15 on sale, and to say I got my money's worth would be an understatement. I wear this thing like three times a week. I'm wearing it now, actually. This dress was my version of the muumuu this summer. Lucky for you, they've produced a ton of them in different patterns. So that's it. Two dresses, two pairs of shorts, two tanks, and a handful of other tops and shoes. "Capsule Wardrobe" is really just a fancy way to say "I wear the same thing almost every day." I'm no stranger to the uniform concept; I explored this idea a year or two ago and concluded it wasn't for me. Then came a new development: I started working in an office. We all know the struggles of managing to look put together every day, and from that the uniform concept was reborn. I won't lie, I was heavily influenced by Matilda Kahl's article about wearing the same thing every day. I started my own experiment and started wearing black on bottom, white on top every day to work. The most magnificent thing happened - getting ready for work became easier. Rather than pulling myself out of bed every day, sitting in my closet for 20 minutes staring, and showing up to work looking like I actually slept in my clothes, I started to feel pulled together. It influenced my work, too. The better I felt about how I looked outside, the more confident I was about everything. Weird how that works, right? So what are my key pieces for making my 9-5 uniform work for me? Let's explore. For someone as clumsy as I am, white on top is not the ideal choice; however, it's a really easy color to find lots of variation with a white blouse! I have multiple white blouses, but they all have really different details. Some are long, some are boxy, some tie up at the waist or have sheer panels. I even throw a pattern in when I feel like it. The variety makes it feel like I'm not wearing the same thing every day...even if I am. I've been looking for a soft wrap blouse like the one here from Ella Moss. Pencil skirts, pants, leggings...I'm not picky. While some adopt the more traditional edition of a uniform [ankle pants + button up], I decided to simplify the process by wearing whatever I wanted on bottom. Some days, it's really warm and I feel like a flowy black skirt; other days I want more polish and go with a pair of high waist trousers. I tend to stick with black pants (pictured: Vince) about 99% of of the time, though. 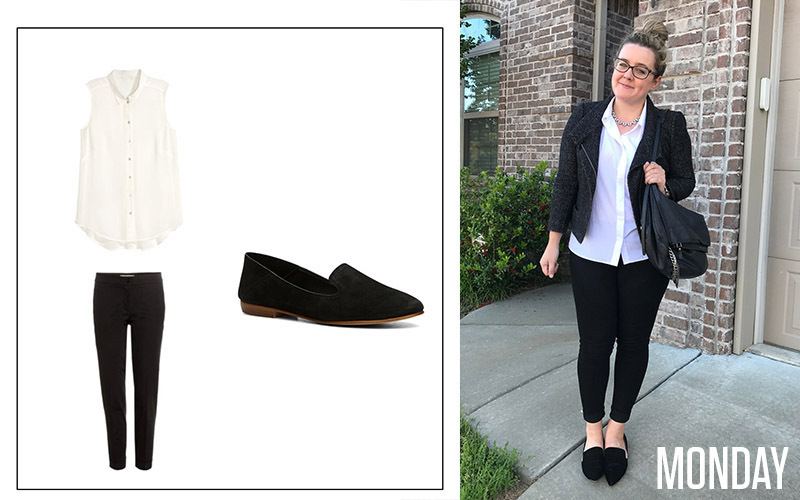 A great pair of pumps is essential for the 9-5'er, and every woman has her favorite pair. I love my Manolo BB's, but I have heard a lot of great things about Diane von Furstenberg shoes for comfort (the pair pictured is the DVF Bonnie pump), so I'm planning on picking up a pair of those soon. Since my uniform is classic black and white, I love adding some flare with a little color with my accessories. I've tested a lot of purses on my way to find the perfect work bag or tote. It has to be able to carry a 13" Macbook, occasionally a DSLR, and all of the other stuff I accumulate throughout the day like makeup, Diet DP, three pairs of sunglasses, etc. I'm really intrigued by this Rebecca Minkoff satchel right now; it looks like the perfect size and has a shoulder strap for when I've got a heavier haul. And if we're being real, I don't always wear heels. A girl's gotta have a killer pair of flats for work as well, and these from Ferragamo have been on my wishlist for months now. When I'm shopping for flats, I look for pairs with unique details (like these bows), a bright color, or super pointy toes. The details are what dress the flats up enough so that you don't feel frumpy. Anyone else trying their hand at the office uniform? On the weekend, it's a free-for-all, but you'll find me in black in white most days of the week right now. This post contains sponsored links from Shopbop.